There is nothing like warm biscuits and apple butter! The smell that fills your home while its cooking is almost as great as its taste! Now you can make your own apple butter at home using just a few simple ingredients and a crock pot (I love mine from Brylane Home)! Hope you enjoy my Simply Spiced Apple Butter recipe! Some people like their apple butter really sweet - I like to taste the apples. Feel free to add more sugar - but its best to taste as you go. You can always add more sugar but you can never take it back out. If you know a local farmer or a neighbor with horses - treat them with your left over peels.Take over a jar of your apple butter and a bag of apple scraps. It's a great way to make sure nothing goes to waste and be a blessing to your neighbor. Plenty of apple butter to enjoy for months - and still plenty to share! What's your favorite way to enjoy apple butter? I was sent the Step2 Deluxe Worskhop at no cost to facilitate this review. If you have ever completed a DIY (Do It Yourself) project , you know the satisfaction you feel when you are able to build something with your own two hands. I love DIY projects because it allows me to unleash my creativity, build something for less than it would cost me to buy it in the store, and even instills a greater confidence is myself. Now, the special kids in your life have the opportunity to share in the fun with the Step2 Deluxe Workshop. This workbench came with so many added items and features. One of my favorites is the Durafoam wood pieces, which not only really look like real wood (but are soft and flexible), but you child is actually able to use these pieces to build any one of four projects (a birdhouse, toy car, plane, or boat). As soon as the workbench was set up, my 6-year old daughter, Eva went right to work "sawing" and "hammering" to build her first birdhouse. Because the workbench comes with four projects, and because the work space is so big, it allows my children to play together, both working on their own unique creations. My husband has his own construction business, and our children see him working on projects at home and of course they see all of his own tools. I was just as excited as my kids to see that this workbench includes a power tool (2 AA batteries not included) that let my kids use tools just like their dad. The variety of tools also add a different dynamic to all of the play activity. We try to teach our kids the value and importance of cleaning up after themselves, and I was so excited to see that this set also includes a pretend shop vac complete with realistic hose and attachment. As a Mom, my absolute favorite thing about the Step2 Deluxe Workshop is that each piece and each tool has a place. I don't have to find bins or boxes to keep all the pieces sorted - Step2 has already done that for me! We recently moved our kids bedrooms around, and in that process we worked a lot on organization. In their rooms, everything has a place, and its just the same with this workshop. My kids are able to play freely and when they are done - put everything away by themselves. With realistic workshop bins and containers - even cleanup time is fun - and that's something both me and the kids can get excited about! This Workshop is "Single Mom Approved"! I grew up in a single parent home and like most single mothers, she only had herself and the good Lord to rely on. Instead of running to my husband with his power tools to put this set together, I wanted to make sure all the single mom's out there could be successful in putting this set together with just themselves and a screwdriver (that's right, no power tools were used when I put this set together). I would say overall, the Step2 Deluxe Workshop is fairly easy to put together. As pictured above - there are no pre-made holes where the screws go, just indentations showing you where they should be placed. I imagine using a power tool would make the set up even quicker, but even with just me and my screw driver it still only took me about 25 minutes to complete it. The screws were definitely not the easiest to get in. It did take some applied pressure, some elbow grease, and a "can do" attitude, but even as I was in the process of seeing the play set come to life, it was evident that the benefits of a sturdy play set, and one I wasn't going to have to go back and tighten later, greatly outweighed the little bit of extra time it took to put it together. "How many pieces does this thing have?" That is always the first question my husband has when I hand him the box to one of our kids new toys or play sets that has to be put together. I can remember buying my niece a kitchen set for Christmas a few years ago and raved about the great deal that I got. When it arrived and I opened the box, I gasped and laughed out loud thinking of my brother having to put together this kitchen set that had at least 35 plastic pieces to it. I was thrilled to open up the box to the Step2 Deluxe Workshop and find only seven sturdy pieces to assemble. Not a fan of having to put thousands of stickers on your child's toys? The Step2 Deluxe workshop only comes with one sheet of brightly colored stickers, which are thick and easy to peel off. They really liven up the play set and are super easy to apply. Each sticker is coded with a letter and a number which corresponds to a picture in the instruction manual. I have put a lot of stickers on a lot of different toys - and by far - these were the easiest! There is nothing about this Step2 product that my kids don't love and no reason not to recommend it highly to all of my friends. I love that my kids have hours of endless creative possibilities. They have their own workshop wood creations they can build and accomplish, and when they are through, they even have fun putting it all away. There are so many features and so many ways to play! We all love some of the "real life" effects that this work shop brings to life with the real, working power tool and the overhead LED light my kids can turn on and off as they work. This is a play set I would even love to add to over the years! I know my kids will be busy accomplishing all their own DIY projects over the years with this work shop and I love the hard-working and sense of accomplishment this set brings to my kids as they play. I hope Step2 will consider creating some new additions to this amazing play set - its definitely something I would purchase - and absolutely something my kids will be adding to their wish lists. I cannot recommend this product highly enough. With the holidays just around the corner, don't you think your little one would love one of these?! Connect: You can connect with Step2 on Facebook and follow them on Twitter, Pinterest, Instagram, and YouTube. You'll also want to make sure to sign up for their Birthday Club where you'll get great coupons before your child's birthday plus other special offers and deals! Buy it: You can purchase the Step2 Deluxe Workshop directly from the Step2 website. It is priced at $149.99. 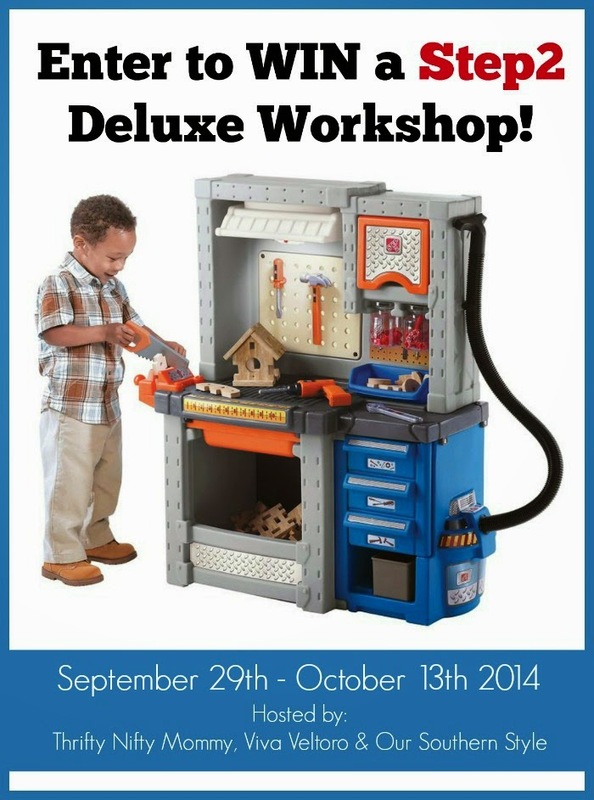 Win it: One lucky person is going a Step2 Deluxe Workshop!! Open to the residents of the 48 contiguous US states, ages 18+. Ends 10/13/14 at 11:59 PM EST. Entry Form Disclosure: I received this product in exchange for my review and honest opinion. This promotion is in no way sponsored, endorsed or administered by, or associated with, Facebook. Viva Veltoro, Our Southern Style, and Thrifty Nifty Mommy are not responsible for prize fulfillment. Giveaway is open to residents of the 48 contiguous US states, age 18+. Giveaway will close at 11:59PM EST on 10/13/14. One (1) winner will be selected randomly from all eligible entries. Amazon link is an affiliate link. I received the Lego Duplo Batman Batcave Adventure set at no cost to faciliate my honest review. Some things in life are just timeless, a front porch swing, a cup of hot chocolate and marshmallows on a cold winters day, your Grandmother's favorite hymn, and watching your kids play with the same toys you loved when you were a kid - all timeless. I remember playing with Legos when I was a kid. I loved all the opportunities for creativity and the never ending fun that seemed to come in the countless hours I spent building my unique creations. With so much technology today, it is so easy for children to be distracted by hours of tv and video games - toys seem to have so much more to compete with now then they did when I was little. One of the things I love most about the Lego Duplo Batman Cave Adventure set is that it brings the best of both worlds to my child. My 5 year old son, and my 2 year old son both love superheroes! They also both love toys that are interactive (and Mom loves toys that encourage creative play). I must say, the Lego Duplo Batman Cave makes us all happy! With so many pieces - there are so many endless possibilities! Lego Duplo gives a suggested age of 2 to 5. However, I gotta say, I quite enjoyed playing with this set myself and could see my older girls, Eva 6, and Mariyah 11, even getting in on the Batman and Catwoman action. I love that Lego Duplo included both a "boy" and "girl" action hero which enable this toy to appeal to all kids. It also allows my son and daughter to even play together. The action heroes are easy to handle and play with and the batmobile not only has the capibility to shoot a yellow dart, but also has room to keep an extra one ready to go. I really was pleasantly surprised by all the pieces I found inside the box. The Lego Duplo sets are a little different than your typical Legos in that they are bigger and sturdier and easy for little hands to use. The Lego Duplo Batcave Adventure also includes a small booklet with easy to follow picture instructions. The box also gives you several different possible building projects your little one can complete. With so many pieces, there truly are so many different ways your child can create their own batman adventure . The details, like the cloth batcape, Catwoman's briefcase, the batmobile flying darts, the working rope and pulley, all provide your child with moving interaction that will keep them playing longer and coming back for more. Who needs TV when you can make your favorite superhero come to life in your own living room! Easy to construct with colors that make building fun and exciting, the Lego Duplo Batcave is sure to please any kid! My boys look for any reason to play "superheroes" and this creative play adventure set keeps them running through the house less, flying off the couch to a minimum, and leaves them with fewer "battle injuries". With the Lego Duplo set, the fun never stops. Tired of today's adventure? Tomorrow you can tear it down and build a new one - the possibilities are endless with Lego Duplo. Holy Lego Duplo Batman! It really doesn't get much more fun than it does with the Lego Duplo Batcave Adventure! Connect: Find out more about Lego Duplo and all of the great building sets they have by visiting their website. You'll also want to "like" them on Facebook and follow them on Twitter too! Buy It: The Lego Duplo Batcave Adventure Set is priced at $49.99, although you can sometimes find it at Amazon.com for less. Win It: One lucky reader will WIN a Lego Duplo Batcave Adventure Set! This giveaway is open to residents of the US who are 18 years of age or older, except where prohibited. This giveaway will end at 11:59pm ET on October 12th, 2014. Enter using the Giveaway Tools entry form below. Good luck! I was sent this item at no cost to facilitate this review. Special thanks to my niece Zellene for allowing me to take her pictures and to her Mom, Janessa, for allowing me to post her pictures. 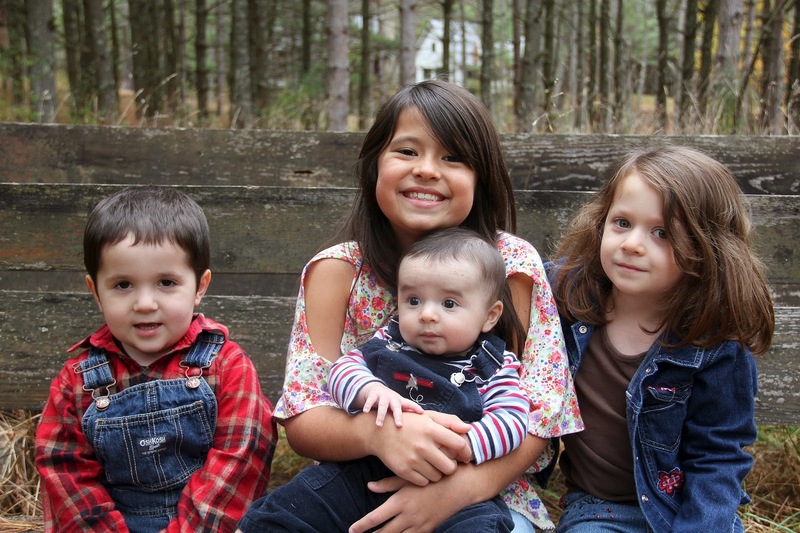 My children loved being rocked almost as much as I loved rocking them. The Graco Soothing Systems Glider allows your baby to feel that same motion, even when you can't be the one to do the rocking. The system comes with an option to plug it in or use batteries which makes it not only versatile but also keeps you from running to the store in desperate need of batteries. At the same time you have the comfort of knowing that if you do need to utilize the system in a location that doesn't have the ability to plug in - the battery option is always available as a back up. I especially love that this bouncer comes with a handle which makes it much easier and safer to move baby along with Mom as you go about your day. The bouncer itself is definitely roomy and very plush and comfy. The bouncer also has its own soothing vibrating feature that you can use both in and out of the glider. Both the bouncer and the bassinet have their own canopies to shield the sun from their eyes while they are snoozing. No need to take one off to put it on the other. With so many features, the portability, plus the space-saving advantage, the Graco Soothing System is sure to please both parents and baby. I love that this system makes my life and my living space a little bit simpler without having to give up the fundamental perks that come having each of these baby items. Graco truly make life a little bit easier for parent's everywhere without having to give up the safety and comfort of the little ones that have captured our hearts. This philosophy truly is why Graco is one of the number one baby companies in America. Connect: Find out more about this Glider and all of the great Graco products by visiting their website, then make sure you "like" them on Facebook and follow them on Twitter. Buy It: You can purchase this Graco Soothing System Glider at Babies"R"Us and Toys"R"Us. It is priced at $239.99. Disclosure: I (Jennifer) was sent the item above at no cost to facilitate this review for my honest opinion. In the world of desserts, Cheesecake is queen. Though it takes some time and effort to bake the perfect cheesecake, the reward is nothing short of delicious. Whether you are having friends over for dinner, or just want to surprise the family for a wonderful after dinner treat, you will “wow” the crowd with this take on New York cheesecake topped with a chocolate ganache drizzle. Whenever I make cheesecakes people always ask, “How did you keep is so moist?” “How do you keep it from cracking?” “What makes your cheesecakes so creamy?” Over my years of making cheesecakes, I’ve tried a lot of different suggestions from home cooks and famous cooks and I’ve added several “cheesecake tips” to make your cheesecake a mouthwatering success. The phrase "ya don't know what you got till it's gone" never seemed to resonate as much as it did my first year away from home. I was 19 and headed off on a brand new adventure (college in Minneapolis, MN). I was excited to leave my small town in West Virginia, a town where no one seemed to ever leave and nothing seemed to change. As my Mom and I packed everything I could fit in the back of her little Toyota Corolla, I was sure I was leaving the "country life" and never looking back. We arrived in Minneapolis the following day and I can still remember the shock I felt as we drove over the I-35W Bridge into Minneapolis. Even at 19, I had never so much as visited a "big city", unless you count the time in 6th grade where my school took a field trip to the National Aquarium in Baltimore's Inner Harbor. As I took in the Minneapolis Skyline, I couldn't help but think perhaps the world was a lot bigger than I had originally anticipated. It wasn't until the car was unloaded, the "I Love You's had been said, and I turned to hug my Mom goodbye, that I realized the huge change my life was about to take. Did I really want to do this? I don't know anyone or anything about living here. What was I thinking?!? In that moment I no longer wanted to conquer the unknown, I desperately wanted to return to everything familiar, everything small, everything I knew to be home. College and my years living in Minneapolis, Minnesota turned out to be some of the best years of my life! I made life long friends, created some of my fondest memories, I grew up a lot, met my husband, had my first child, and grew up some more. As I embraced my new life in the city, I found myself searching for ways to bring the country back in my life. I listened to country music (something I swore used to give me a headache), I created small DIY projects around my home that I could share with my daughter, I jumped headfirst into cooking and baking the recipes I grew up with, and I slowed down and began to remind myself to enjoy the simple things in life. After eight years of living in Minnesota, God, Who has a glorious sense of humor, opened a door for me to return to that same small town in West Virginia, the place I was so sure I'd never return to, where I currently serve on staff as an Associate Pastor, leading worship, student ministries, and a host of other things in between. I have four children now and a wonderful hardworking husband who is my best friend and team mate in life - we do everything together. It really is true that having a family changes you. Once upon a time I was ready to dive into the busyness of life. Time couldn't go fast enough and the adventures couldn't be crazy enough. Now, all that has changed for me. I long for the days to slow down and for the simplicity of just enjoying the little things in this great life God has blessed me with. Don't get me wrong. I still have big dreams. I still long for adventures. But in between all of those big things I don't want to miss the little dreams and the little adventures that are just as important, if not more. No matter where you call home, in the city, or some place south of the Mason Dixon Line, there are things about southern living we all long for; the food, the family values, the fashion and rustic simplicity. That really is the reason I decided to begin this blogging adventure. I believe that on some level those are the values, the hopes, and the little things we all want out of life, but sometimes, life doesn't always make it easy, and sometimes our life doesn't reflect it as it should. My family and I hope to share with you some things along the way that will bring a little bit of Our Southern Style to you and that I as you follow Our Southern Style, you will embrace some new ways (and maybe even reclaim some old ways) to bring a little bit of country living to your own life - and create a southern style - all your own. Thanks for being a part of my adventure!